I dedicate this Valentines Day to a very special lady. | The mind is an unexplored country. No – not this special lady. Not this time. 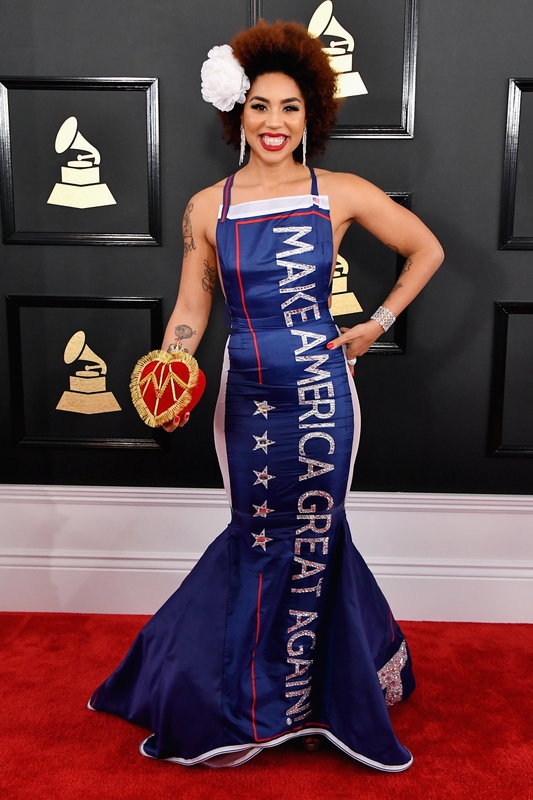 In 2017, I pledge my troth to Joy Villa. I am not going to claim a long-standing fandom for Princess Joy. Straight up: I had never heard of her 48 hours ago. But watch this! If that’s not the equivalent of waving a yarmulka at a Nuremberg rally, I don’t know what is. Now it is entirely possible that Joy was just out to grab some attention. Her MAGA dress may be nothing more than a publicity stunt. Joy does have a history of (ahem) unconventional clothing on awards night. Black – 2015; Orange – 2016. Kudos to the lady nevertheless. The entertainment industry has grown quite mouthy of late – and its message is being met by a colossal raspberry. Hollywood/Hollyweird/Whollyweird has taken to lecturing its inferiors – ie you and I – and sermonising from a great height. And again, in response to Joy Villa’s wardrobe surprise, the entertainment industry has demonstrated that its calls for tolerance are not even skin deep. Read about that at Breitbart. I’d post a few samples here, but I’ve already donated my mop to the cleaners at the Staples Centre. They need it to clean up the bucketloads of hypocrisy… sure hope that stuff comes out of the carpet without too much trouble. Oh well – the event’s producer said he wanted a political night. I guess there’s political and political, eh? You can show some support for Joy by purchasing her music. I’m already in for the limited edition autographed CD. « Remember, you read it here first.